What are the Common Subtypes of Breast Cancer? Profiling the biologic make-up of breast cancer tissue can help doctors determine how well a patient will respond to different cancer treatments and how aggressive the cancer might be. Researchers are focused on three subtypes—hormone receptor-positive, HER2-positive, and triple-negative breast cancer—to better understand the biology of the disease and, potentially, how any weaknesses can be exploited. During diagnosis, breast cancer tumor tissue obtained through a biopsy is tested for the presence of certain proteins—most commonly, estrogen receptor, progesterone receptor, and HER2. Receptors are proteins that detect signals that tell the cells to grow. A positive result from a hormone receptor test means that a receptor is present, whereas a negative result means that it is not. Knowing the receptor status of the cancer is extremely important in determining the best strategies to treat the cancer. Hormone receptor-positive breast cancers test positive for estrogen and/or progesterone receptors. Breast cancer cells that have estrogen receptors are called estrogen receptor (ER)-positive, and those with progesterone receptors are called progesterone receptor (PR) positive. Collectively, this is the most common breast cancer subtype, accounting for roughly 65 percent of all breast cancer diagnoses. If your tumor is hormone receptor-positive, your treatment may include specific medications which block hormone signaling or reduce your body’s natural estrogen production, such as tamoxifen or aromatase inhibitors. If your tumor cells do not have receptors for either hormone, it is called hormone receptor-negative. 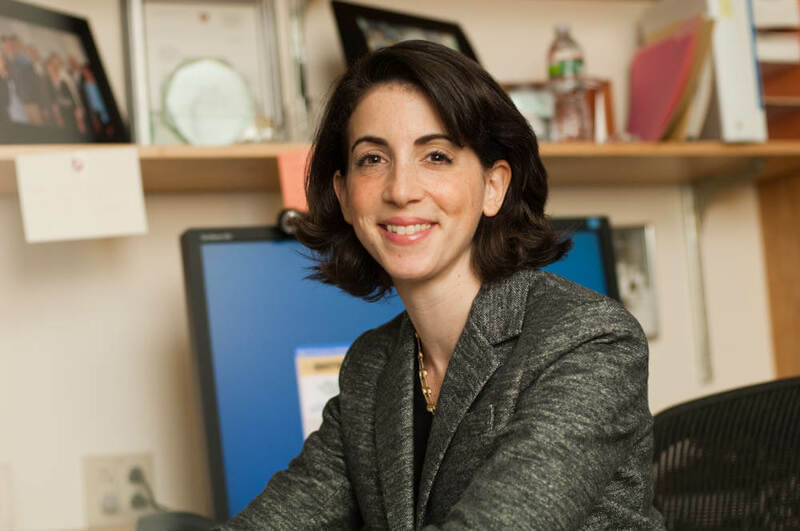 Erica Mayer, MD, MPH, a breast oncologist in the Susan F. Smith Center for Women’s Cancers at Dana-Farber Cancer Institute. HER2-positive breast cancers can test positive for HER2 either by having excessive amounts of the HER2 receptor on the surface of the cancer cell, or too many copies of the HER2 gene inside the cancer cell. The HER2-positive subtype is found in about 20 percent of all breast cancer patients, and can also be either hormone receptor-negative or hormone receptor-positive. Treatment for HER2-positive breast cancer may include drugs targeting HER2, such as Herceptin (trastuzumab), Perjeta (pertuzumab), or Kadcyla (TDM1). Triple-negative breast cancer, which lacks ER and PR receptors and is HER2-negative, is the least common of these three subtypes, accounting for about 15 percent of cases of breast cancer. Triple-negative breast cancer may be a more aggressive form of cancer. In patients with early-stage disease, chemotherapy is often recommended for treatment. Dana-Farber Cancer Institute investigators are leading and participating in an array of clinical trials designed for all subtypes of breast cancer. Clinical trials are available at any point in a patient’s therapy, with the aim of evaluating new strategies designed to specifically target each subtype of breast cancer. Patients with breast cancer are encouraged to speak to their providers about their eligibility for clinical trials. Learn more about treatment for breast cancer from the Susan F. Smith Center for Women’s Cancers at Dana-Farber Cancer Institute.